This is part one of a series about care of citrus – how to recognize and deal problems without the use of harmful chemicals. I have a lot of empathy with doctors – I see them being waylaid at parties by a guest who wants an on the spot diagnosis of their current ailment while, on the opposite side of the room I’ve been rumbled by a guest (another avid gardener) whose eyes light up at the thought that they may finally get an answer to their thorny citrus problem (ouch!). In all my years of gardening and teaching, questions about citrus far outnumber those about any other topic. Yet, the fundamentals of caring for citrus are pretty basic – KEEP the PLANTS HEALTHY – SICK PLANTS are MORE PEST and DISEASE PRONE. The health of the plant affects all stages of growth and development – roots, leaves, flowers and fruit – if the tree is sick, or nutritionally deficient, it won’t be able to do it’s glorious thing – provide you with year round oranges, limes, lemons, cumquats, grapefruit, mandarins – where would we be without them? I use a lemon just about everyday and realized, very early on, that even on my small, suburban block that I needed two lemon trees – in fact, I have three if you count the Lemonade. In the sub-tropics the best varieties of lemon are Eureka and Villafranca (almost thornless). The Meyer does well too, but I am not fond of it’s less than lemony flavour – it’s almost perfumed skin and juice are a result of it being a cross between a lemon and a mandarin. 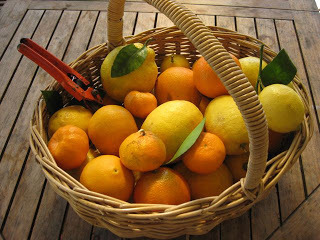 Citrus are heavy feeders – it stands to reason really for they do a lot in a season – put on large flushes of new leaves, a heady covering of gorgeously fragrant flowers and, if you have cared for them, a bumper crop of delicious, juicy fruit – they are very busy little trees. The nurturing of citrus pays great dividends and I couldn’t put it better than Jackie French, one of my favourite gardening authors, in her book Organic Gardening in Australia (1986). “When we first came here (Braidwood, in the Southern Highlands of NSW) we inherited about twenty old citrus trees. They were buried in ink weed and blackberry, had been rubbed to bits by cattle and were totally defoliated except for a few yellow leaves. Ten years later, we’ve lost two of them, but the others are dark green, bushy and good bearers. To cure our trees we mulched them to the drip line about half a metre high, using old lucerne hay, hen manure, stable sweepings and old sawdust. The first lot took nearly nine months to rot down. Then, as the soil became more active we mulched heavily three times a year, with organic matter and nitrogen rich additions (like chook pooh and urine). 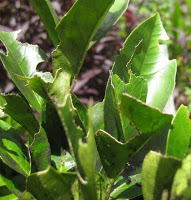 What does her experience teach us about the care of citrus – mulch, mulch and more mulch and, as my grandmother would say – patience is a virtue. Just remember that, armed with this simple knowledge, you will be able to get your newly planted trees to fruit well within a couple of seasons – you won’t have to wait five years.TIP: Don’t overfeed with nitrogen rich fertilizers – you will end up with over large and very pithy fruit. 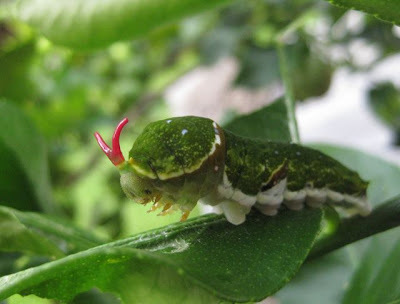 The caterpillar of the Large Citrus butterfly – the red horns, on the front of their head, emerge as a defense mechanism when they are threatened – they think it makes them look really scary! And now to caterpillars on citrus and what to do about them. The answer is basically – nothing – just enjoy the butterflies flitting around your garden – they do very little damage. You may see a small black/brown/white caterpillar on the leaves of your citrus – that looks a bit like a bird dropping. 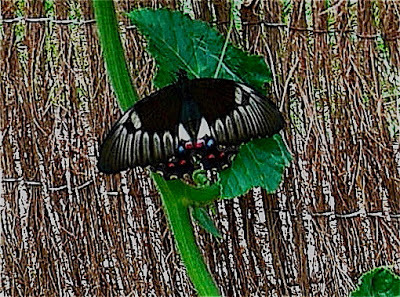 This is the larvae of the Small Citrus butterfly – a mainly black and white chappie. TIP: If you want to know about how to prune, feed and care for citrus go to the previous post. 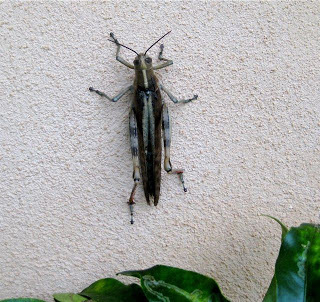 Don’t blame the damage, in the photo above, on caterpillars – it’s caused by these large fellows crickets/grass hoppers or, in the case of this one – the largest of all – field locusts. It’s easy to do because both chew from the edge of the leaves inwards, but caterpillars on citrus don’t devastate the tree in the way that these critters do. What to do about them? Plagues of them vary from season to season, usually at their worst in mid-summer, but are not always a problem. 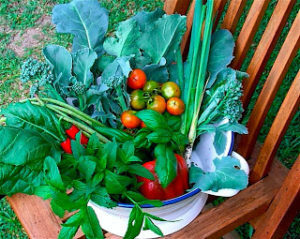 Keep your plants healthy (but don’t overfeed) and interplant with a wide variety of strong smelling flowering plants. Enjoyed your post again, Jackie French features on my bookshelves too. What I've noticed in the Mullum Yard this summer and last year's Spring, a vast decrease in butterfly caterpillars with no butterflies this summer. I also have a thriving colony of paper wasps. They feed their larvae on chewed up caterpillars.